Meg Lindsay has everything a woman could want except happiness. Can an adopted Chinese child bring her what she lacks? All her life, Meg Lindsay's mother told her what a disappointment she was. Try as she might, Meg never measured up, and the emotional bruises still hurt as an adult. In Meg's opinion, no one could be a worse mother than the woman who gave birth to her--that is, until Meg has a child of her own to care for. Two young girls lived in an orphanage in China. Unwanted because of a deformity and the lack of family registry, Little Zhen An was destined to spend her childhood in the orphanage. Her only friend was a slightly older blind girl, Wen Ming. After Meg and her husband, Lewis, adopt one of the girls, Meg's love for her new daughter grows daily, but the tension, fear, and uncertainty of motherhood drive Meg to the brink of despair. Fearing that she is becoming the kind of mother she hates, she fights circumstance, rebellion, a loving but at times tense marriage, setbacks, and the native selfishness that lives in all of us. Meg's journey is a magical one as East meets West and as imagination aligns with reality. 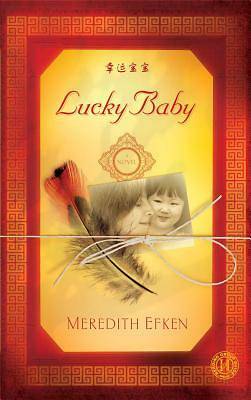 Lucky Baby spans the world, bridges the gap between heart and soul, and shows that the greatest power on Earth is forgiveness.